Home theater receivers provide the connectivity, audio decoding and processing, power for your speakers, video source switching, and, in many cases, video processing features and more, for a home theater setup. 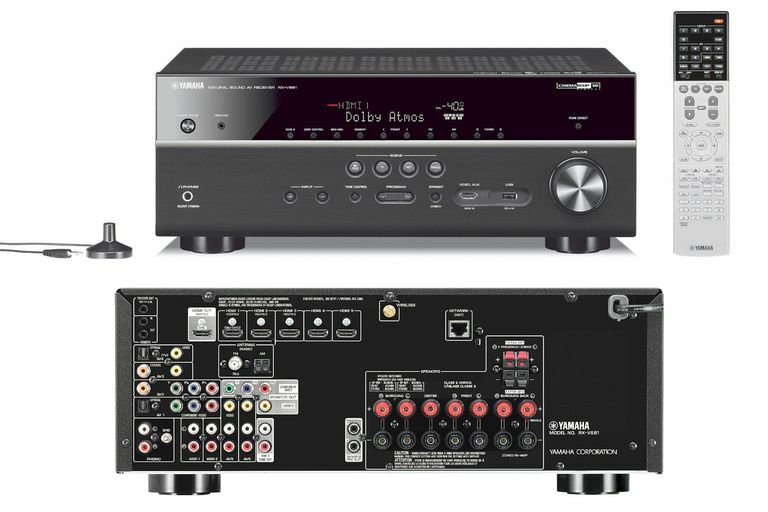 Depending on brand and model, there are variations on what a specific home theater receiver might offer in terms of features and connections, but there are common basic steps you need to get it installed and running. When unpacking your home theater receiver, make sure you take note of what it comes with. Remote control (and batteries), FM and/or AM radio antennas, and an illustrated quick start guide and/or user guide. AC power cord that may be permanently attached to the rear of the receiver, or may a separate cord that plugs into a receptacle provided on the back of the receiver. If the receiver has built-in Wi-Fi and/or Bluetooth, it may have permanently attached fold up/down antennas, or the antennas may be packed separately, which can be screwed on to the provided terminal(s). A microphone is usually provided to aid in speaker setup for most mid-range and high-end home theater receivers. More on this later. After unpacking the receiver, the included accessories, and documentation, sit down and read the Quick Start Guide and/or User Manual before going further. Missing a step because of wrong assumptions can cause problems later. Find a place to put your receiver. However, before sliding into any available spot you think is desirable, take the following into consideration. Home theater receivers generate heat, especially if they house a lot of amplifiers that can pump out a lot of power. The receiver needs to be placed where air can circulate freely so that it maintains an acceptable internal running temperature. Even if your receiver has a built-in fan, still allow at least 3 to 4 inches on each side (also check any guidelines in the user manual) and at least 6 inches beyond the rear. This not only allows air to circulate around the entire unit when it is running, but the 6 inches behind the rear also leaves room for all your needed connection cables. If the receiver has a Wi-Fi or Bluetooth antenna located on the rear panel, make sure that there is room to rotate or extend it vertically. This may require 4 to 6 inches of space above the rear of the unit. If the rear of the receiver cannot be accessed after it is slid it into the desired space, then all cables and speaker wire need to be attached before the receiver is placed in its permanent position. Once the receiver is situated, it is time to prepare for the connection process. Connections can be done in any order—but here are suggestions on how to organize this task. Before you proceed, it's a good idea to make some labels that can be taped or glued to your cables. This will help you keep track of what is connected to each speaker terminal, input, or output on the receiver. Also, make sure both ends of your speaker wire and cables are labeled so that not only the end that is connected to the receiver is labeled, but the end that actually connects to your speakers or components are also identified. You don't need to do this, but no one has ever said, "I am so upset these cables are so easily identifiable." The most efficient way to create labels is by using a label printer. These can be found at hobby and office supply stores, or online. Three examples of label printers include the Dymo Rhino 4200, Epson LW-400, and Epson LW-600P. Before you start labeling cables, make sure they are the optimum length. It is important to note that although it is desirable to have the shortest possible length that reaches from your speakers and components to the home theater receiver, take into account that you may have to access move the receiver in order to access the rear panel periodically to add, disconnect, or re-connect a wire or cable. This means that you want to make sure that all your cables have enough slack to allow for this. If you are able to access the connection panel of the receiver from the rear, then one extra foot should be fine. Also, an extra 18-inches of leeway should do the trick if you just need to angle the receiver to perform these tasks, but if you need to pull the receiver forward to access the rear connection panel, you might need as much as 2 or 3 extra feet of length for each of your wires/cables. You don't want to be placed in a situation where the cables, or connection terminals, on your receiver are damaged because everything is too tight when you have to move it. Once you have all your wires and cables ready, you can start connecting according to your personal preference, but the following sections outline a useful approach. Do not plug a home theater receiver into AC power until the rest of the following connection process is completed. The first thing to connect should be any antennas that came with the receiver (AM/FM/Bluetooth/Wi-Fi). Also, if the home theater receiver does not have built-in WiFi, or you do not want to use it, you may have the option of connecting an ethernet cable directly to the receiver's LAN port. When connecting speakers, make sure you match the speaker terminals on the receiver so they match your speaker placement. Connect the center speaker to center channel speaker terminals, left front to main left, right front to the main right, surround left to surround left, surround right to surround right, and so on. If you have more channels or are trying to accommodate a different type of speaker setup (such as for Dolby Atmos, DTS:X, Auro 3D Audio, or a powered 2nd Zone), refer to the added illustrations in the provided user manual to find out what terminals to use. In addition to making sure that each speaker is connected to the correct speaker channel, make sure the polarity (+ -) of those connections is correct: Red is (+), Black is Negative (-). If the polarity is reversed, the speakers will be out-of-phase, resulting in an inaccurate soundstage and poor low-end frequency reproduction. There is another type of speaker you need to connect to your home theater receiver, the subwoofer. However, instead of connecting to the type of speaker terminals used for the rest of your speakers, the subwoofer connects to an RCA-type connection that is labeled: Subwoofer, Subwoofer Preamp, or LFE (Low-Frequency Effects) output. The reason that this type of connection is used is that the subwoofer has its own built-in amplifier, so the receiver does not need to supply power to the subwoofer, but merely the audio signal. You can use any durable RCA-style audio cable to make this connection. With the speakers and subwoofer connected to the receiver, the next step is to connect the receiver to your TV. Every home theater receiver is now equipped with HDMI connections. If you have an HD or 4K Ultra HD TV, connect the HDMI output of the receiver to one of the HDMI inputs on the TV. The next step is to connect source components, such as an Ultra HD Blu-ray/Blu-ray/DVD player, Cable/Satellite Box, Game Console, Media Streamer, or even that old VCR if you still have one. However, with regards to that old VCR, or old DVD player that may not have an HDMI output, many home theater receivers manufactured since 2013 have either decreased the number of analog video connections (composite, component) provided, or have eliminated them all together. Make sure that the receiver that you purchase has the connections you need. Home theater receivers generally provide both analog and digital audio connection options. If you have a CD player, connect it to the receiver using the analog stereo connection option. If you have a DVD player that does not have HDMI outputs, connect the video signal to the receiver using component video cables, and the audio using either the digital optical or digital coaxial connections. Depending on the capabilities of your TV (3D, 4K, HDR) and your receiver, you may have to connect the video signal to the TV directly and the audio signal to your home theater receiver, such as when using a 3D TV and 3D Blu-ray disc player with a non-3D compatible receiver. Regardless of the capabilities of your TV and home theater receiver, you may opt to not pass video signals through the receiver. Consult your user guide(s) for more details on the options you have to connect AV components to your home theater receiver. Also, even if you don't connect video from your source components to the receiver, make sure that the HDMI, or any other video output option provided by the receiver, is connected to the TV, as the receiver has an onscreen menu system that aids in setup and feature access. Once all your initial connections are completed, it's time to plug the receiver into your AC power outlet and slide it into its intended position. Once this is done, turn on the receiver using the front panel power button and see if the status display lights up. If it does, you are ready to proceed with the rest of the setup. Place batteries into the remote control. Using the remote control, turn the receiver off, and then back on again, just to make sure that the remote is working. Also, since, as mentioned previously, most receivers have a user interface that appears on your TV screen, make sure you have your TV turned on, and set to the input that the receiver is connected to, so you can proceed through the onscreen menu's Quick Setup functions. The actual quick setup steps may vary in order, but most likely, you will be asked to select the menu language you want to use (English, Spanish, French for North American Receivers), followed by network/internet setup via ethernet or Wi-Fi (if the receiver provides these options). Once you establish your network/internet connection, check for, and download any new firmware updates. Additional things you may be prompted to check during your initial setup is input source confirmation and labeling, and Automatic Speaker Setup (if this option is provided—more on this later). Some manufacturers also provide access to an iOS/Android app that allows you to perform basic setup and other control functions from your smartphone. Most home theater receivers provide the user with two options for getting your speaker setup to sound its best. Option 1: Utilize the built-in test tone generator function in the receiver and use either your ear or a sound meter to balance the speaker level of each channel, and the subwoofer, so that they should balance with each over. However, although you might think you have great ears, using a sound meter is actually a very useful tool as it will provide you with numerical decibel readings that you can write down for reference. Option 2: If provided, use the Automatic Speaker/Room Correction/Setup system. These are built-in programs that employ the use of a provided microphone that plugs into the front of the receiver. The microphone is placed in the primary seating position. When activated (you are usually prompted via the onscreen menu), the receiver automatically sends out test tones from each channel that are picked up by the microphone and sent back to the receiver. At the conclusion of this process, the receiver determines how many speakers there are, the distance of each speaker from the listening position, and the size of each speaker (small or large). Based on that information, the receiver then calculates the "optimum" speaker level relationship between the speakers (and subwoofer), and the best crossover point between the speakers and the subwoofer. However, there are some important things to keep in mind about using automatic speaker setup/room correction system. First, you need a room with complete silence for the best results. Close all doors and windows, and make sure everything else is quiet around the house. If you can hear it, so can the microphone. This could result in inaccurate adjustments. The system may also prompt you that there is background noise detected and the receiver cannot move forward with the process. Second, as quick and easy as these automatic systems are, these results may not be totally accurate. Once the setup procedure is completed, it's a good idea to check the results (accessible via the onscreen menu), and confirm that things such as speaker distance and speakers are correct. Also, use the test tone manually and see if each channel level is balanced with the rest of the speakers. A common issue is the center channel may be too soft and the subwoofer may be too loud. Most receivers will allow you to make changes the results manually. Sometimes raising the center channel level a 2 or 3dB and lowering the subwoofer by about the same amount might be in order. Only do this, of course, if you are unhappy with the sound you are hearing. It is also important to note that are some variations regarding the details of each brand of the automatic speaker setup program, and the versions included on high-end receivers sometimes take in more variables than the versions included on a mid-range or budget-priced home theater receiver. Once again, it is good to consult your user manual for more details. Depending on the brand/model of your receiver, automatic speaker setup/room correction systems go by different names, such as: Anthem Room Correction (Anthem AV), Audyssey (Denon/Marantz), AccuEQ (Onkyo), Dirac Live (NAD), MCACC (Pioneer), DCAC (Sony), and YPAO (Yamaha). Once you have everything connected and your speakers calibration completed, you are set to go! Turn on your sources, and make sure that the video is displayed on your TV, the audio is coming through your receiver, and that you are able to receive radio through the tuner. As you get more comfortable using operating the basic features, there are advanced features on many home theater receivers of which you may be able to take advantage. For a rundown on both the basic and advanced features that may be available on your home theater receiver, refer to our article: Before You Buy A Home Theater Receiver. These additional features have their own setup procedures, which are illustrated in the user manual, or via additional provided documentation either packaged with the receiver, or accessible via online download from the manufacturer's official product page. Although a home theater receiver is the central hub of your home theater, there are still lots factors that need to be taken into consideration that might affect its operation and performance. If you find you are having trouble after setting it up, take a look at some basic troubleshooting tasks that you can perform that may solve the problem. If not, you may need to enlist the aid of a professional.